Disney confessions. . Wallpaper and background images in the Disney Pixar Cars 2 club tagged: cars 2 mjfan4life007 disney pixar. This Disney Pixar Cars 2 fan art might contain toaster. 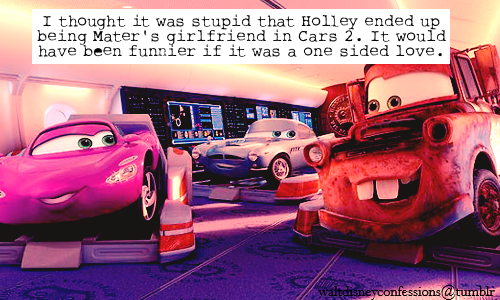 DO YOU HAVE SOMETHING AGAINST MATER AND HOLLEY? THEY ARE GETTING MARRIED YOU KNOW! I agree with Hubie_Manes, Mater and Holley are a cute couple, what's your problem??!!!!!! !